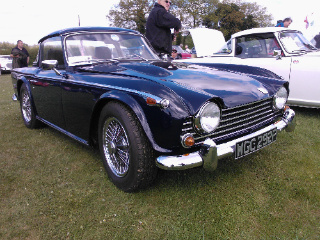 The Triumph TR5 sports car was launched in 1967. 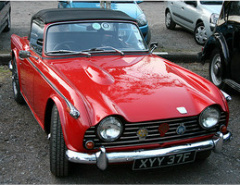 It used a 6-cylinder engine that was, essentially, a longer stroke version of the unit used in the Triumph 2000 saloon. However, the increased performance came from an improved exhaust manifold, a revised camshaft and, of course, from the more efficient PI system itself. The TR5 was regarded as a stop gap measure, as was the TR3B, between phasing out the TR4A and introducing the redesigned TR6. 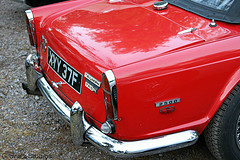 Triumph was simply not prepared to countenance any additional retooling costs associated with even a partial redesign. For this reason, production only lasted for thirteen months, when 2,947 units were built. 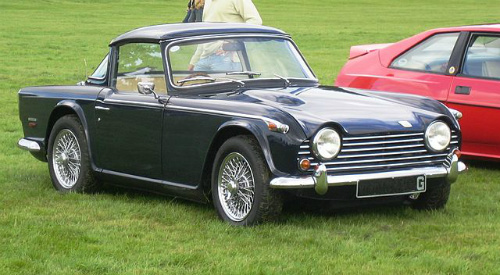 In terms of external appearance, there was little difference from the TR4A it replaced. However, the principal change was down to the engine. 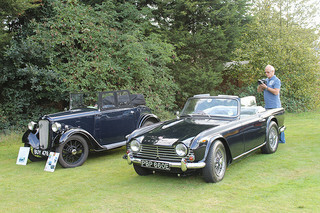 The TR4A had a 2.1 litre, 4-cylinder engine with two carburettors, whilst the TR5 used a 2.5 litre, 6-cylinder, fuel injected unit with a compression ratio of 9.5:1. 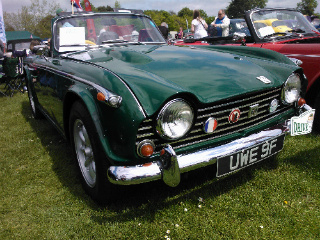 A badge on the boot saying "Triumph TR5 PI"
The use of fuel injection (PI) was almost unheard of in the mid 1960's. 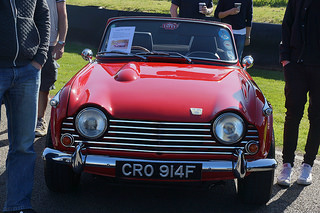 Consequently, Triumph made a great play about this and, in its sales literature, proclaimed that the TR5 was the first production sports car to be fitted with PI. Furthermore, for the first time, the brakes were power assisted. A total of 1,161 TR5's were earmarked for the UK, whilst the rest, all left hand drive models, were exported to, amongst others, France, Belgium, and Germany. No TR5's were exported to the US. 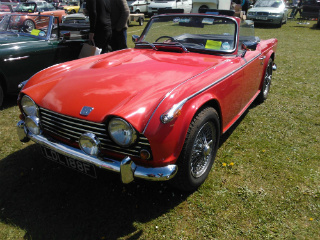 Instead, a version, known as the TR250, was specially built for that market, and was produced in tandem with the TR5. An interesting fact was that the TR5 used a Lucas fuel injection system which had a tendency to periodically stop working when the petrol tank was less than a quarter full. In my own TR5, I added a Bosch system and never had any such problem. 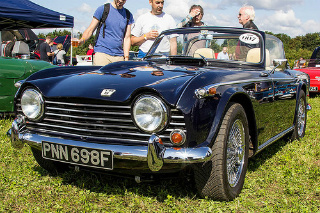 A 1967-68 Triumph TR5, in outstanding condition, could command anything up to £40,000/$64,000, whilst restoration projects start around £15,000/$24,000.